Once you have created your spreadsheet with your impressive charts, you may need to copy the Excel chart into PowerPoint or Word. There are a few options for this which are worthwhile considering. If you copy the chart (CTRL+ C – see below if it won’t allow you to copy) then go to PowerPoint/ Word and paste it (CTRL + V), it pulls it through. You will notice that all the elements of the chart are still there i.e. you can click on the series etc. 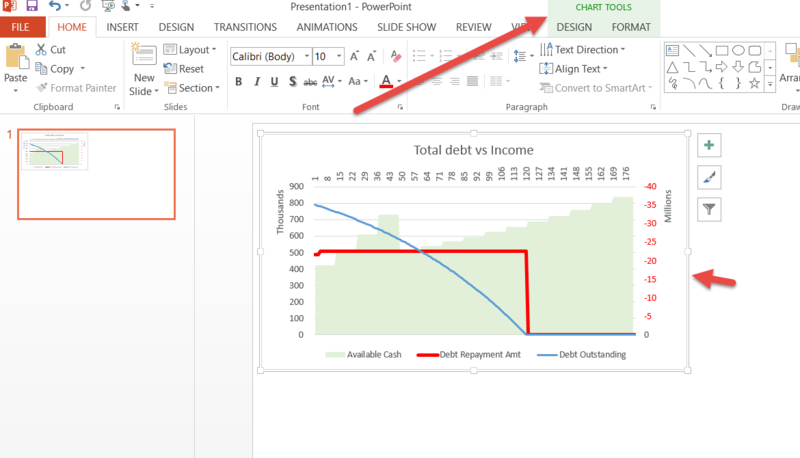 You will see that even within PowerPoint and Word you get a new ribbon item to work with the Chart. You will also notice that it is linked i.e. 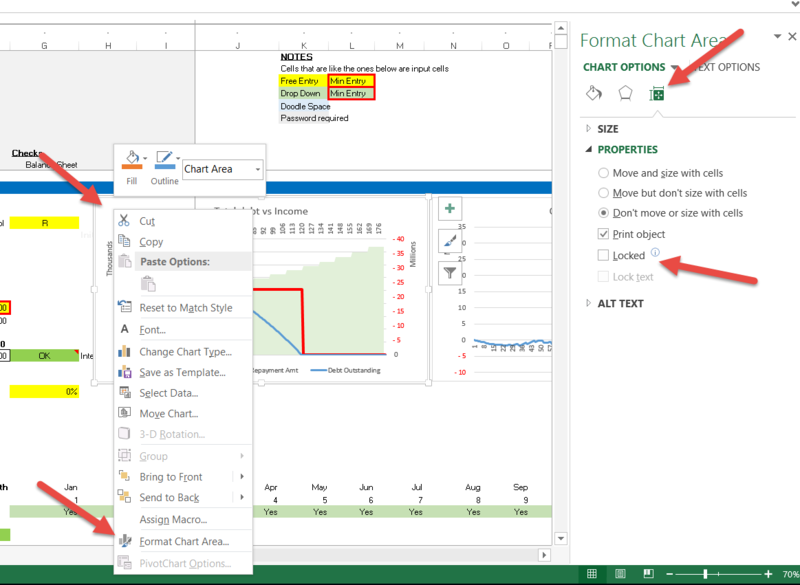 if you change the data in the Excel file, the PowerPoint or Word chart also changes. Perhaps you don’t want to have the chart linked (and sometimes the linked chart causes colour issues). 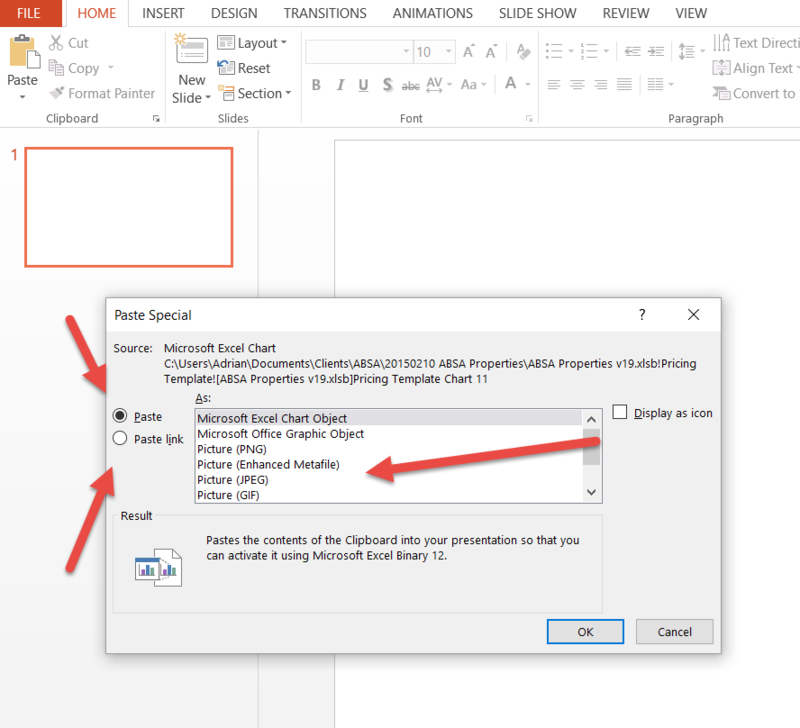 In this case you can copy the chart in Excel as before, but now when you go to PowerPoint/ Word you click on the Paste dropdown button and either choose Paste Special (for more options) or the button with the mountain portrait for an instant static picture. If you choose Paste Special then you have more options as shown below. Note that you can specify the picture format (JPEG, GIF Etc) and also notice the Paste Link option (in which case you can paste a static JPEG or GIF but it still looks at the Excel file). Once you have the chart in PowerPoint/ Word you can format it the way you like. Depending on some settings you may have a situation where you can’t click on the graph and copy it. This is probably because the sheet has been protected and the properties of the graph have been set to leave them as LOCKED (so you can’t click on the chart or right click to copy it). Firstly you will need to unprotect the sheet in Excel (Click REVIEW, Unprotect Sheet and give the password if required). Then right click on each graph, choose the Format Chart Area, click on Properties and untick the Locked box. This tells Excel that when the sheet is protected, the chart will be unlocked. Now you should put the protection back on. You will now be able to click on and copy the chart. If you don’t have the password and you desperately need to copy the chart into PowerPoint/ Word you will need to copy the cells around it. 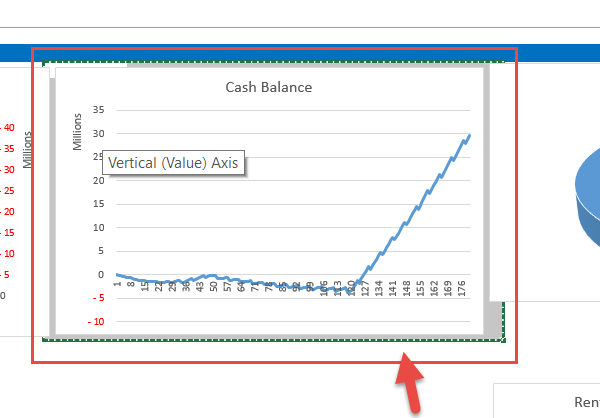 So as shown below we highlight the cells behind the graph and click copy (or CTRL +C). 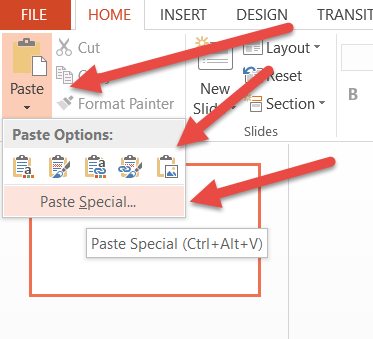 Then in the PowerPoint/ Word document you would choose Paste Special and choose what format of picture should be used. Now that it is a picture you can click on it and you will see that in the Ribbon is a FORMAT tab. At this stage you can crop it to remove any unnecessary images. For more of these type of suggestions, have you looked at the Excel Charting and Graphings Course?